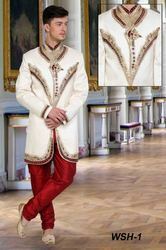 Leading Exporter of wedding mens sherwani, men heavy work sherwani, mens wedding sherwani, men wedding sherwani, designer sherwani for wedding and designer embroidered sherwani for wedding from Delhi. 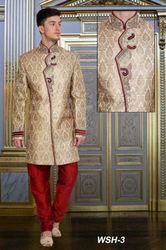 Wedding Mens Sherwani in off white shade, Maroon Border on center of the Top. Designer Wedding Sherwanis offered comes in exciting designed choices, superb smooth finish and elegant looks which makes them highly exciting choices to use during wedding functions. Further, the colorfully decorated finish provided on the fabric also makes them have high market demand. Some of its features include available in elegant rich designs; available in different size options; attractive finish and color combinations; featuring detailed workmanship standards as desired by the customers. 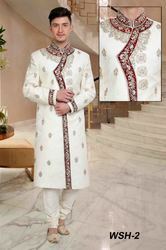 Mens wedding sherwani in off white Shade and Heavy embroidered. Men Wedding Sherwani in Copper and Maroon Shade, Hand Embroidery Front of the Sherwani. Fabric is brocade and silk. 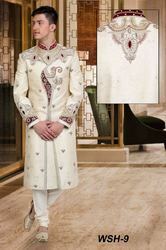 Designer Sherwani For Wedding With Embroidery of Front of the Sherwani and Cuffes of the Sleeves. Fabric is Brocade , Fabric will be exactly same as shown in the picture. All sizes will be done. Price quoted are for regular sizes till size 44. Delivery : 15-20 days. Everything will be done on order. Designer Embroidered Sherwani For Wedding with Beautiful Embroidery on front of the Sherwani and Sleeves, Fabric is Brocade ( fabric will be same as shown in the picture) All sizes will be done. Price quoted are for regular sizes till size 44.